Be the first to share your favorite memory, photo or story of Darline. This memorial page is dedicated for family, friends and future generations to celebrate the life of their loved one. 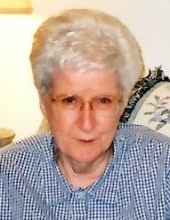 Darline Johnson, age 85, of Buffalo, Texas, passed away peacefully surrounded by her family March 16, 2019 in Bryan, Texas. Funeral services are planned for 11 A.M., Wednesday, March 20, 2019 at Walters’ Buffalo Funeral Home in Buffalo, Texas. Interment will be in Marquez Cemetery in Marquez, Texas. The family of Mrs. Johnson will be present to receive friends Tuesday, March 19th from 6 P.M. to 8 P.M. at the funeral home. Darline Johnson was born January 30, 1934 in Marquez, Texas. She was one of two children born to parents, William & Etta (Penrod) Boyd. When Darline first moved to Buffalo, she worked at Nestor's Cafe. She later worked at many nursing homes including numerous years at the Buffalo Nursing Home. She loved to read and in her younger years, she enjoyed cooking, crocheting and working in the yard. Darline most especially loved her two granddaughters. They meant the world to her and she was always so proud of them. Darline had lived in Buffalo most of her life and was a member of the Buffalo Church of Christ. She was preceded in death by both of her parents and sister, JoAnn Ferguson. Surviving family members include loving husband, J.W. Johnson of Buffalo; son, Darwin Copeland of Dew; daughter, Reta King (Ricky) of Centerville and granddaughters, Sarah & Kathleen King, both of Centerville. Darline is also survived by many extended family and friends. Walters’ Buffalo Funeral Home in Buffalo, Texas is in charge of arrangements. To send flowers or a remembrance gift to the family of Darline Johnson, please visit our Tribute Store. "Email Address" would like to share the life celebration of Darline Johnson. Click on the "link" to go to share a favorite memory or leave a condolence message for the family.